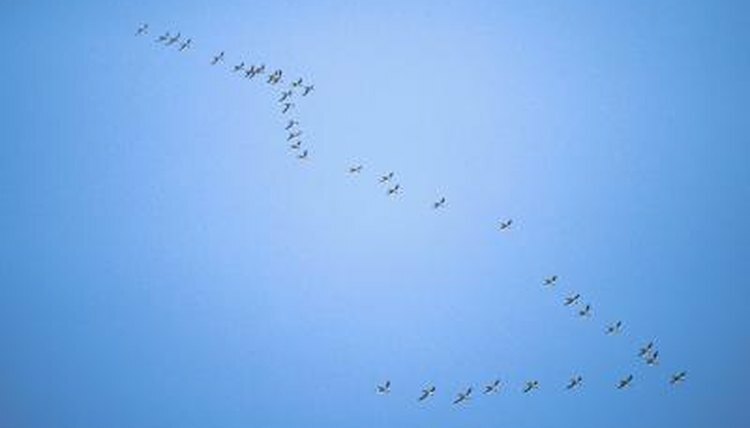 There are few things that are a better sign that spring is on its way than the sight of geese flying north in their distinctive V formation. Snow geese (Chen caerulescens) travel long distances, as far as 5,000 miles, between their nesting grounds and their winter homes. The extension of their breeding grounds due to ice melt and a greater understanding of the importance of protecting not just wintering areas, but also resting areas along the way, has led to a drastic increase in the numbers of snow geese seen migrating in recent years. The snow goose is a mid-sized goose, averaging in length between 27 and 33 inches with a wing span averaging 4.5 feet and a weight of around 7 pounds. There are two color phases, white and blue. White snow geese are white with black wing tips, a pinkish-orange beak, and orange legs and feet. The juveniles are similar in appearance but are smaller and their plumage is light gray instead of white. Blue phase geese are not blue at all but dark brown, except for their heads and under their tails, which are white. Young blue geese do not have white heads, but other than that look just like adults. Snow geese nest on the arctic tundras of Canada and Alaska. They build their nests on dry ground near ponds, lakes and streams. Once all the eggs in the clutch have hatched, the geese leave their nests and walk, sometimes as far as 50 miles, to marshy areas where grasses are plentiful. During the summer months, the young geese feed and grow rapidly. Once summer has ended, in late August, the family will begin their journey and take their place in the V formation. Young geese making their first migration and older or infirm birds travel near the back of the formation where wind drag is reduced. The snow geese take one of three established routes, known as flyways, to migrate. One of the flyways runs through the Great Lakes region and down the Mississippi Valley, another runs over the Rocky Mountains and across the Great Plains and the third runs down the Pacific Coast. Creatures of habit, they follow the same routes and stop in the same places year after year, the same ones as their parents before them. Snow geese spend their winters largely in coastal areas. They can be found in the southern areas of both the Atlantic and Pacific coasts, and the Gulf Coasts of America and Mexico. They prefer wide open spaces with access to water, but can also be seen in agricultural areas feeding on any grains left behind after harvest. Come late February they will take to the air again to begin their journey north.